Our Software Architecture and Design Tests allow you to experience an online examination in the real-time environment. In every online test on Software Architecture and Design, you will be presented with Multiple Choice Questions (MCQs) which will test your skills in Software Architecture and Design Concepts in a detailed and comprehensive manner. In the test, each question will have 4 options to choose from. You should select only 1 correct option as an answer and then move on to the next question. Once you submit answers to all the questions, you will be given your final test score. In the Online Software Architecture and Design Test, for every correct answer, you will be given 2 points. There will also be negative marking of -1 for every wrong answer. So, you will have to be more careful in choosing the answers to the question in your online examination. If needed, you should skip to the next question and come back to the previous question later so that you can do proper time management for the online mock tests. 1. "Software Architecture and Design Practice Tests" - In Software Architecture and Design practice tests, there will be a series of practice tests wherein you can test your Software Architecture and Design concepts on every chapter separately. There will not be any time limit on these tests. So, Software Architecture and Design Practice Tests should be the first set of tests which you should attempt. Goto these practice tests here. 2. "Software Architecture and Design Mock Tests" - In Software Architecture and Design mock tests, there will be a series of mock tests wherein you can test your Software Architecture and Design concepts on every chapter separately, but there will be a fixed time limit per test. So, it is similar to Software Architecture and Design Practice Tests, but with an added constraint of time limits. 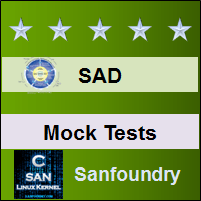 You should try Software Architecture and Design Mock Tests if you are appearing for any online examination soon. Goto these mock tests here. 3. 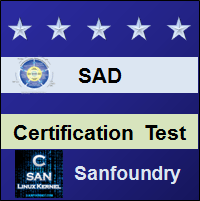 "Software Architecture and Design Certification Test" - Once you are through with your Software Architecture and Design concepts, then you should try our Software Architecture and Design Certification Test wherein Sanfoundry will issue a free Certificate to you if you scored either Grade A* or Grade A in Software Architecture and Design Certification Test. Goto Software Architecture and Design Certification test here. 4. "Software Architecture and Design Internship Test" - If you are interested to do Internships in Software Architecture and Design at Sanfoundry, then you must take our Software Architecture and Design Internship Test. 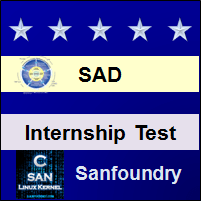 If you scored either Grade A* or Grade A in Software Architecture and Design Internship Test, then you are eligible for Internship at Sanfoundry in Software Architecture and Design. Goto Software Architecture and Design Internship test here. 5. "Software Architecture and Design Job Test" - If you are a fresher, a dropout, an experienced person and if you know Software Architecture and Design well and looking out for jobs in Software Architecture and Design domain at Sanfoundry (or our Network of Companies), then you should try and qualify our "Software Architecture and Design Job Test". 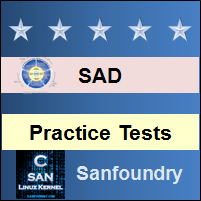 If you scored either Grade A* or Grade A in Software Architecture and Design Job Test, then you are eligible for a Job at Sanfoundry (or our Network) in Software Architecture and Design domain. Goto Software Architecture and Design Job test here. For every "Software Architecture and Design Practice Test", Total Questions: 20, Total Time: Unlimited. For every "Software Architecture and Design Mock Test", Total Questions: 20, Total Time: 20 Minutes. For "Software Architecture and Design Certification Test", Total Questions: 50, Total Time: 1 hour. For "Software Architecture and Design Internship Test", Total Questions: 50, Total Time: 1 hour. For "Software Architecture and Design Job Test", Total Questions: 50, Total Time: 1 hour. Before you get started on these series of online tests on Software Architecture and Design, you should learn, study and practice our collection of 1000 MCQs (Multiple Choice Questions and Answers) on Software Architecture and Design here. We also prefer that you should practice Software Architecture and Design practice tests and mock tests completely before attempting the certification test. Here is the list of online practice tests and mock tests on Software Architecture and Design. Each online test focuses on a "Specific chapter of Software Architecture and Design". So, you should try both practice test and mock test on every chapter to do a self-assessment of your knowledge (along with time-limit constraints) in every area or sub-topic of Software Architecture and Design. Software Architecture and Design Certification test, Internship test, and Job Test are mentioned at the end of this list. 1. Software Architecture and Design Test 1 – This set of online test on “Software Architecture and Design” tests your skills on Software Engineering Design Methods, Software Design Processes, Software Design Management, Product and Markets, Product Planning, Project Mission Statement, Software Requirement Specification, Product Design Analysis, Needs Elicitation Documentation and Analysis. 2. Software Architecture and Design Test 2 – This set of online test on “Software Architecture and Design” tests your skills on Generating Alternative Requirements, Evaluating and Selecting Requirements, Finalizing Product Design, Prototyping and UML Use Case Diagrams, Use Case Descriptions and Models, Engineering Design Analysis, UML Class and Object Diagrams, Conceptual Modelling, Engineering Design Resolution Activities. 3. Software Architecture and Design Test 3 – This set of online test on “Software Architecture and Design” tests your skills on Engineering Design Principles, Modularity Principles, Architectural Design, Specifying Software Architectures, UML Package and Component Diagrams, UML Deployment Diagrams, Generating and Improving Software Architectures, Evaluating and Selecting Software Architectures, Finalizing Software Architecture. 4. Software Architecture and Design Test 4 – This set of online test on “Software Architecture and Design” tests your skills on Advanced UML Class Diagrams, Drafting a Class Model, Static Modelling Heuristics, UML Sequence Diagrams, Interaction Design Process and Interaction Modelling Heuristics, UML State Diagrams, Advanced UML State diagrams, Designing with State Diagrams, Visibility, Accessibility and Information Hiding. 5. Software Architecture and Design Test 5 – This set of online test on “Software Architecture and Design” tests your skills on Operation Specification, Algorithm and Data Structure Specification, Design Finalization, Patterns in Software Design, Layered Architectures, Collection Iterator Pattern, Mid-Level Design Pattern Categories and Broker Pattern, The Facade and Mediator Patterns, The Adapter Patterns and Proxy Pattern. 6. Software Architecture and Design Test 6 – This set of online test on “Software Architecture and Design” tests your skills on The Generator Category, Factory Patterns and Singleton Patterns, The Prototype Pattern, Reactor Pattern and Command Pattern, Architectural Business Cycle, Architectural Patterns, Reference Models, Architectural Structural Views, Architecture and Quality Attribute, System Quality Attributes Discernable at Runtime, System Quality Attributes Not Discernable at Runtime, Business Qualities. 7. Software Architecture and Design Test 7 – This set of online test on “Software Architecture and Design” tests your skills on Architecture Qualities, Architectural Styles I, Architectural Styles II, Refinements of Styles, Unit Operations, Applying Unit Operations to User-Interface Software, Ramification of Addressing Quality Attributes, Analyzing Software Architecture, Overview of Software Architecture Analysis Method. 8. Software Architecture and Design Test 8 – This set of online test on “Software Architecture and Design” tests your skills on SAAM Applied to Financial Management System, Observations on SAAM, Architectural Reviews-Cost and Benefits, Review techniques, Review Practice, Architecture Description Language, Capturing Architectural Information in an ADL, Choosing an ADL, Forming the Team Structure. 9. Software Architecture and Design Test 9 – This set of online test on “Software Architecture and Design” tests your skills on Creating a Skeletal System, Exploiting Patterns in Software Architecture, Ensuring Conformance to an Architecture, Building Domain Specific Languages, Flight Simulation-A Case study in Architecture for Integrability, Creating Products and Evolving a Product Line, Organizational Implications of a Product Line, Component Based Systems. 10. Software Architecture and Design Test 10 – This set of online test on “Software Architecture and Design” tests your skills on CelsiusTech : A Case Study in product line development, Referenced Architectures, Open Systems, Standards I, Standards II, The Meteorological Anchor Desk System – Case Study I, The Meteorological Anchor Desk System – Case Study II, Architecture and Legacy Systems. 11. Software Architecture and Design Certification Test - This set of online free certification test on "Software Architecture and Design" tests your skills on all areas (all chapters, topics and subtopics) of Software Architecture and Design. 12. 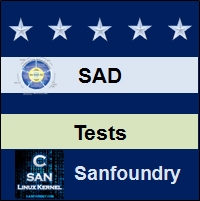 Software Architecture and Design Internship Test - If you scored either Grade A* or Grade A in our Software Architecture and Design Internship Test, then you can apply for Internship at Sanfoundry in Software Architecture and Design. 13. 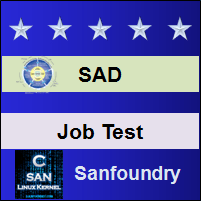 Software Architecture and Design Job Test - If you scored either Grade A* or Grade A in our Software Architecture and Design Job Test, then you can apply for Jobs at Sanfoundry in Software Architecture and Design domain. Best Wishes for your Software Architecture and Design Tests!